According to WHO, a pandemic is the spread of a disease on a global scale. The globalization of the modern singular world has led to a dynamic development of both communicable and non-communicable types of epidemiology. That is why in this book, the authors have analyzed new epigenetic and etiopathogenesis mechanisms, pathomorphosis and pathokinetics of clinical manifestations of classic and new pandemics, from influenza to mental illnesses. 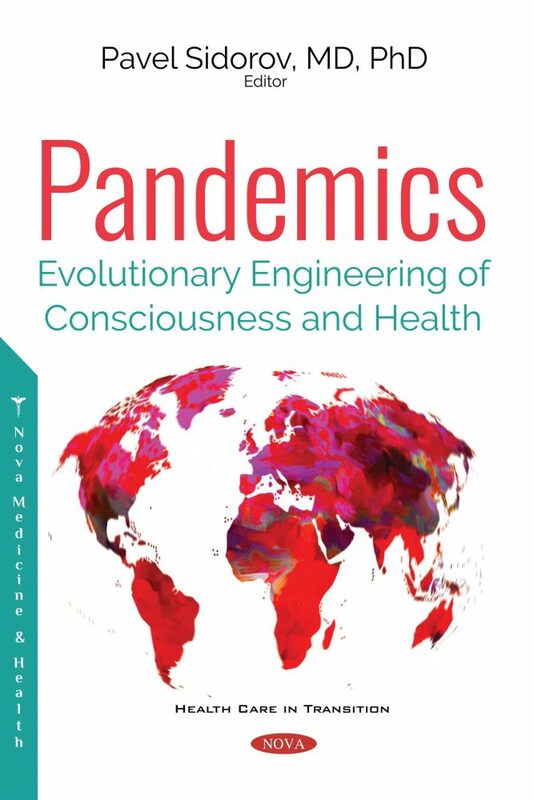 The need to consider pandemics as a tool for civilizational management and evolutionary engineering of public health and consciousness is justified. The closest relationship between the biological reservoirs of renewable strains in animals and humans is shown for historical models of influenza pandemics. The constantly increasing difference in the life expectancy of people and animals turns acquired immunity into an instrument for the evolutionary renewal of mental immunity as a biopsychosociospiritual identity matrix and the basis for the security of the individual and society. The management of new risks and the multimodal navigation of the “viral management” of human evolution are becoming priorities for the modern mental phase of the technological revolution. Exponentially growing and uncontrollable migration facilitates the inter-species and interracial, cross-cultural and trans-cultural spread of pathogens with poorly predicted pandemic potential. The book systematizes multidisciplinary strategies for primary prevention and early interventions. Particular attention is paid to the integrative forms of assistance based on the synergetic methodology of mental medicine. An innovative approach is suggested for the creation of automated online networks during and at the threat of pandemics, using the advantages of “extreme intelligence” and “system digital resistance” for the generation of both infectious and non-infectious risks. (For example, the epidemic of teenage suicides in Russia from 2016-2017 was induced by victimological societies in social networks; trolling manipulation of public consciousness or mental terrorism in electoral political campaigns or economic crises with a managed stock market panic). The peculiarity of the modern hybrid world is a steady increase in the prevalence of all major mental disorders, which is suggested to be designated as a pandemic of mental immunodeficiency. Its pathogenesis basis is epigenetic accumulation in many generations of functional disorders of mental immunity, predetermining the possible pathokinetics and pathoplasty of mental disorders. In the model of early childhood psychic traumatization, clinical manifestations of mental immunity dysfunctions as a multimodal interface between personality identity and habitat are described. Thus, the “missing link” between etiopathogenesis and clinical pathoplasty of early symptom formation is found. Block-modular protocols of early intervention based on the technological platform of mental medicine are proposed. The famous expression of Nobel laureate Peter Medawar (“Genetics proposes, epigenetics disposes”) is appropriately supplemented by the mission of mental medicine, which embodies and implements project models of quality and style, the image and meaning of life in adaptive engineering and self-management of consciousness and health.